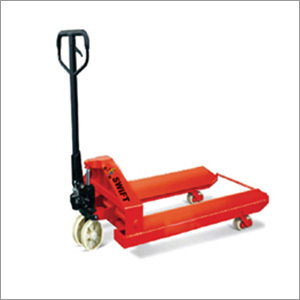 If you are looking for heavy-duty hydraulic reel pallet truck, then we have the perfect solution for you. We are prestigious manufacturer and supplier of these material handling equipment, which are commonly used for simple movement of paper rolls and similar products between two places. It is sturdily designed to work efficiently in all working environments. Its compact design further helps in its easy maneuverability. The hydraulic pallet truck can be provided in assorted dimensions of fork, in tune with the customer's requirements. This equipment is completely free from fork bending problems. Shri Vinayak Packaging Machine Pvt. Ltd. is dedicated to serve client's requirements for pallet trucks and hence has employed a team of quality inspectors, which monitors the entire stage of planning and implementation of production processes. It is their duty to assure that the material handling equipment for warehouses etc. are designed as per national and international quality standards. Not only quality procedures, but regulatory affairs are also being monitored by our team of experts.